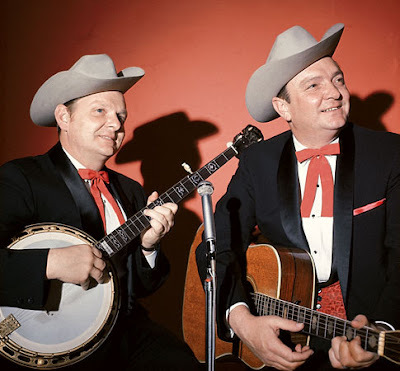 Carter Stanley, half of the seminal bluegrass band The Stanley Brothers, would have been 90 years old today. He didn't make. Although his younger brother Ralph still is touring, the hard-drinking Carter died of cirrhosis more than 50 years ago. As pointed out painfully in a 2004 article by Eddie Dean in The Washington Post, ever since the movie O Brother Where Art Thou? Ralph Stanley has won all sorts of accolades and respect and generally is considered the grand living patriarch of bluegrass. But Carter, outside of bluegrass and folk circles, has been all but forgotten. Few would argue that [Ralph] Stanley has long since earned every penny of his career-capping cash-in, which a few years ago seemed as likely as his winning the Virginia Lottery. Yet there is a nagging sense that this Appalachian fairy tale is missing its crucial character, if not the leading man. ... Without Carter, there would have been no Stanley Brothers, perhaps the most revered brother act in country music history. Carter was the founding member and the driving force, while kid brother Ralph, at least in the early years, mostly tagged along for the ride. So today on his birthday we celebrate Carter Stanley with some of the music he left behind. First, here's an audio clip of Carter sharing the stage with bluegrass originator Bill Monroe. The Stanley Brothers broke up for a couple of years in the early '50s. During part of that time, Carter joined Monroe's Bluegrass Boys. Check out the dis of Flatt & Scruggs in this song's introduction. Here the Stanleys, with their band The Clinch Mountain Boys perform on Pete Seeger's mid-60s television show. I'm including this simply because it's my favorite Stanley Brothers song of all time. And here, the Stanleys cover a Hank song. Not Hank Williams, Hank Ballard! Some bluegrass purists hate this! I like it, even though it would have been far more bitchen had they done "Work With Me Annie" instead.